Popularly known as the Indian version of the ‘Orient Express of Europe’ the World’s Leading luxury train - Maharajas Express made a debut in the year 2010. The luxury train has ever since won several & consecutive prestigious annual world travel awards. One can experience a magnificent luxury tour in ancient palace style on the Maharajas Express. The journey is sure to enchant you as the luxury carriages carry you through the most scenic places. It offers four interesting itineraries to help you see historic monuments and structures. The royal tours on Heritage of India, Indian Panorama, Indian Splendor and Treasures of India make you experience the royal ambience on the tour. These tours throw light on the rich ancient heritage which is seen around various places throughout India even today. The journey helps you visit UNESCO World Heritage Sites, pass through wildlife parks, taste royal culture of ancient rulers in India in the historical monuments and palaces. There are also traditional folk dances and performances to entertain you at some of the destinations. While traditional warmth greets you at arrival, royal hospitality sees you through the rest of this palatial journey. Each carriage is designed in such a vibrant way to give you the feel of being in a palace. There are 23 total carriages to treat you to royal luxury. It not only caters to your basic needs in full royalty and traditional hospitality but keeps you from boredom. You can have you quiet evening time or relax with a book in the peaceful lounge. What’s more is that you can shop from the onboard souvenir store. Pamper your senses with the health/beauty spa treatment onboard. You can taste the wide spread lip smacking cuisine from fine dine cutlery in dining cars. Chill out at the bar where you are served beverages and spirits of international brands. The large windows help you view the journey as the Train cruises through sub-urban landscapes. 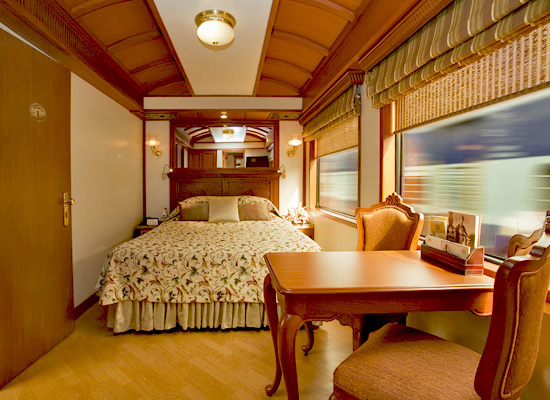 Travelling on the Indian luxury Train is like a journey to the bygone era. The luxury train has won several noted awards including back-to-back award from the year 2012 to 2015. “The World's Leading Luxury Train” was awarded to The Maharajas Express at the World Travel Awards. As your journey ends here, you get a farewell cheerful goodbye while you carry on the luxurious experience in your memories forever. Maharajas’ Express is a luxury train in India that was introduced in 1982. The main purpose of this train was to promote tourism in Rajasthan. Its fitness and beauty can be compared to the Orient Express of West. 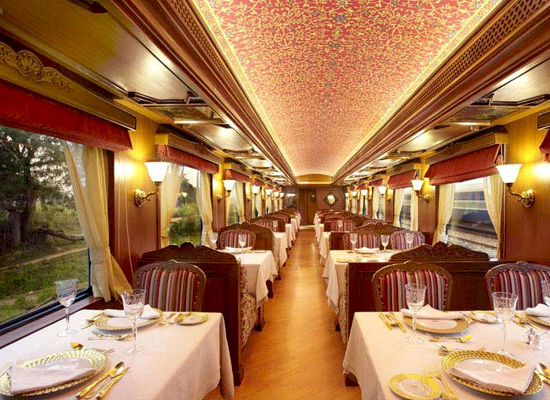 Maharajas’ Express has redefined the field of luxury train in India. By travelling in Maharajas’ Express we can explore the richness of India in the true spirit it was intended to. If travelling is your aspiration then do not miss a trip on Maharajas Express luxury train. This is one of the costliest trains of the world and staying on Maharaja Express is a dream come true for travelers. Want to know in detail about each cabin type? Let us explore the Maharajas’ Express cabin and check out why Maharaja Express is so popular. Let us talk about the facilities inside this train. The Maharajas’ Express has many exclusive elements like hand cut crystal glass, world class cuisine, gold plated cutlery and others. Apart from these, the Maharajas’ Express has many modern technologies like satellite channels, climate control, LCD TV, internet and many others.